This article is about the stage in the Super Smash Bros. series. For the place, see Luigi's Mansion. For other uses, see Luigi's Mansion (disambiguation). Luigi's Mansion is a stage seen in the Super Smash Bros. series. It first appears in Super Smash Bros Brawl, and later reappears in Super Smash Bros. for Wii U and Super Smash Bros. Ultimate. 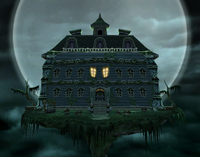 The stage shows five rooms from Luigi's Mansion (based on the Nursery, the Kitchen, the Study, the Ball Room, and the Foyer), and the mansion itself is destructible. Players can destroy a part of it by attacking the pillars in the separate rooms. When a player does this a few Boos will appear and then quickly fade away. If players destroy all the pillars, the stage will just be flat. Later, the stage will rebuild itself. The pillars on the bottom floor can not be destroyed until the pillars above are. Also, if all the players are not in any of the rooms and the mansion is whole, it shows the front of the mansion. The Ω form of the stage is set on the roof of the mansion. The interior is no longer accessible, but players can wall jump off of the walls. In Super Smash Bros. Brawl, the stage is unlocked after three matches are played as Luigi. It is also where the unlock match for Luigi takes place. In Super Smash Bros. for Wii U and Ultimate, the stage is available from the start. If the player manages to glitch the camera and look under the crib in the nursery, they will find a picture of a Boo. This page was last edited on January 24, 2019, at 20:05.